Add 2 cups of the fruit juice to a medium sized bowl. Sprinkle the gelatin over top and allow to sit for 1 minute. Bring 2 cups of the fruit juice to a boil. Add the hot juice to the cold juice and stir until gelatin has dissolved. Divide mixture evenly among 10-12 three ounce sized Dixie™ cups. Chill until set. Serve cups with spoons. Alternatively, you can pour the mixture into a 9x13 inch baking pan and chill until set. Then, cut squares or shapes with a cookie cutter and serve. Last week I showed you how easy it is to make healthy popsicles at home. 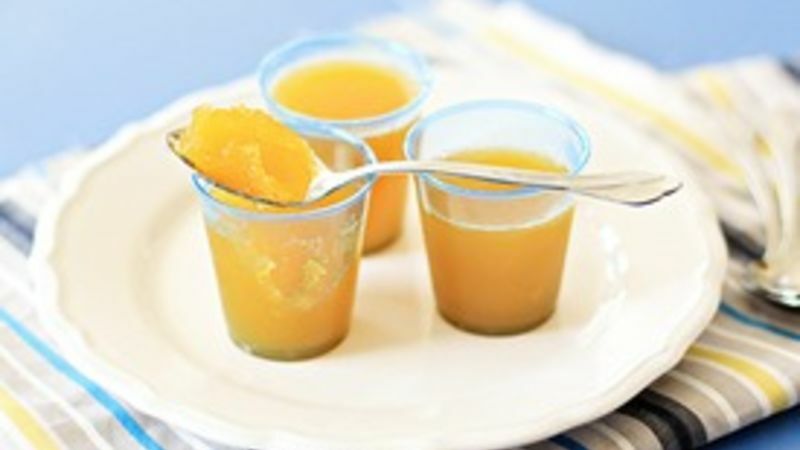 This week I thought I'd share with you another fun treat that my kids and I have been making -- Homemade Gelatin Cups. My kids are always asking me to buy those gelatin cups, but it's cheaper and healthier to make them at home! We've tried grape juice, cranberry juice, pomegranate-blueberry, and our new favorite: peach-mango juice. We always choose 100% juice, just mix up the flavor each time. My kids, like most their age, are not big vegetable eaters. We encourage lots of fruits and are creative about adding vegetables in their diet. So this time I decided to try a fruit and vegetable juice blend because it provided a full serving of vegetables (and fruit) in every serving of juice. My kids loved them and they don't even know the difference! I care a lot about nutrition, and it's always exciting to turn something that would otherwise be a sugar loaded treat into something healthier and just as delicious. You only need three items to make your own Fruity Gelatin Cups -- unflavored gelatin, 100% fruit juice, and Dixie cups. If you want, you can add fruit into the gelatin, but you don't have to. By using 100% fruit juice, you are cutting out a lot of sugar and empty calories that are in store-bought gelatin and adding nutrients to an otherwise refreshing sweet treat.